As patients assume more of the financial burden for medical expenses, urgent care centers are spending more money, staff resources and time collecting medical payments. Unfortunately, this trend will most likely accelerate in the coming years. Priority Care, a chain of urgent care centers in three regions (Arizona, North Carolina and Texas), was facing a backlog of past due invoices totalling nearly $200,000 in one region alone. Priority Care invested significant staff resources in making follow-up calls and mailing printed reminders pursuing patient payments. 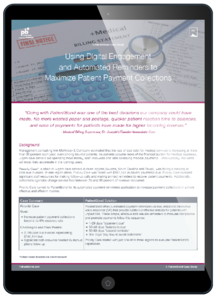 Priority Care turned to PatientBond for its automated payment reminders application to increase payment collections in a more effective and efficient manner.